It's that time of year when I actually start cooking again! There's something about the crisp air in the fall that just lures me from a summer of hiding back into the warm kitchen. I just can't help myself. Lounging around in an oversized sweater and slippers while a pot of stew simmers on the stove is pretty unbeatable. What do you think? Do you agree with my list? If not, what would you add or take away? Also, I just learned that spices lose their potency after about 6 months to 1 year. For this reason, it's wise to buy 1-2 oz. at a time. If you're unsure if they are still good, smell them before use. If and when they stop giving off an aroma it's definitely time to replace them. Spices sold at the grocery store work fine, but thanks to the fact that they start out in a warehouse, and then sit on a shelf for who knows how long, by the time they get to your grocery cart there is a very good chance they are stale. Plus, the FDA doesn't require suppliers to list add-on ingredients found in many spices (flour, salt, rice, etc), and spices are not required to be free of contaminants. Purchasing whole spices and grinding them yourself ensures that you are getting the purest, highest quality spices available. 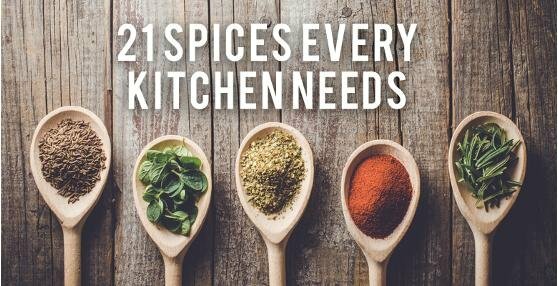 Sure, it's a little more work and a little more money than buying pre-packaged spices from the grocery store, but in the long run it could take your cooking to the next level!